Posted on 11/26/2017, 10:15 am, by kittykill, under Handmade Gift Ideas, Holidays. This holiday season don’t forget your fuzzy best friend. No, I’m not talking about Kevin in Accounting. I’m talking about your favorite four legged buddy. 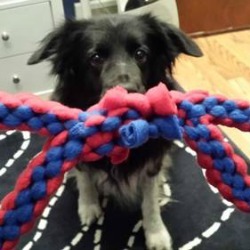 Surprise them with their very own Double Looped Dog Tug Toy. Smeddley shares her tutorial for a strong dog toy that can be made for pups of all sizes. Earn your angel wings by crafting several and taking them to your local shelter or rescue. The dogs will appreciate their new toy while they are waiting for their furever home. From Kevin in accounting to Kevin the Pomeranian, our Handmade Holiday Gift Guide has something for all your furry friends. Poor Kevin. He gets no love. Let’s decoupage his red stapler!